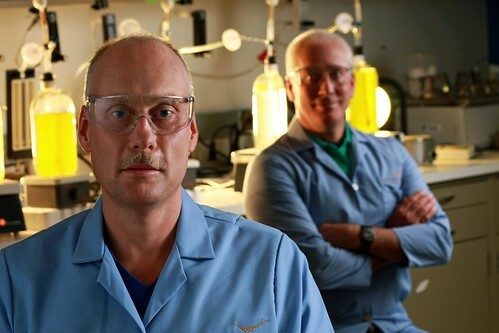 Scientists at PNNL's Marine Sciences Laboratory in Sequim, Wash., will grow algae in a marine environment as part of the National Alliance for Advanced Biofuels and Bioproducts being funded by American Recovery and Reinvestment Act. 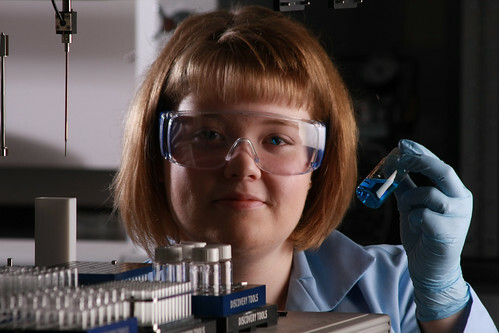 A scientist at the Bioproducts, Sciences, and Engineering Laboratory (BSEL), a joint Pacific Northwest National Laboratory and Washington State University research facility in Richland, Wash., uses a liquid-handling robot to prepare metal solutions for later impregnation onto catalyst supports. RICHLAND, Wash. — The Department of Energy's Pacific Northwest National Laboratory will receive about $14.2 million for its role in two biofuels research consortia announced today by Energy Secretary Steven Chu. The consortia will advance the science and technology needed to remove hurdles and accelerate the ability to convert plants and other biological material into biofuels that can be used in existing infrastructure. Chu funded the consortia with nearly $80 million of American Recovery and Reinvestment Act funds with the goal of bringing new biofuels to the market and developing a cleaner and more sustainable transportation sector, as well as reducing dependence on foreign oil sources, according to the announcement. "I'm proud that PNNL will play a role in both of these consortia and in the Department's pursuit of drop-in, infrastructure-compatible biofuels from plants and algae," said PNNL Director Mike Kluse. PNNL will co-lead one consortium with the National Renewable Energy Laboratory and then play a large role in a second consortium led by the Donald Danforth Plant Science Center. For more than 10 years, PNNL has advanced the science and technology for converting biomass into liquid transportation fuels, bioproducts and bioenergy. Its key focuses have been catalysis, environmental biotechnology and analysis. Biomass is biological material that comes from plants, wood, waste and other materials and can be converted into fuels and other products. "We'll be calling upon our entire suite of disciplines and capabilities in our support to these consortia," said John Holladay, PNNL biomass manager. "We are positioned to address the entire spectrum of scientific challenges associated with developing a sustainable biofuels transportation sector — from fundamental research to applied processes." PNNL is a world leader in proteomics, gasification and catalysis research — capabilities critical to better understanding the cellular dynamics of biomass materials and to more completely and economically converting biomass into fuel. The Lab will leverage expertise and capabilities at the Bioproducts, Sciences, and Engineering Laboratory, a facility located on the Washington State University Tri-Cities campus where PNNL and WSU researchers collaborate; the Institute for Interfacial Catalysis, which PNNL launched in 2005 to bridge the gap from fundamental catalysis research to process application; EMSL, the Environmental Molecular Sciences Laboratory, a DOE national scientific user facility located at PNNL; and PNNL's Marine Sciences Laboratory, DOE's only marine research facility located in Sequim, Wash.
NABC's charter is to develop and demonstrate science and technology that is needed to produce biofuels made from plants that, most importantly, will work in existing infrastructure. PNNL is a co-lead with the National Renewable Energy Laboratory. This consortium will pursue six options for processing biomass — specifically, those from plants called lignocellulosics — to make fuels. Of those, PNNL will lead tasks associated with converting biomass into an intermediate oil that can go into a petroleum refinery to produce gasoline, diesel or jet fuel. PNNL's Holladay will serve as chief technology officer. Of the $33.8 million for NABC, PNNL will receive $7 million. Washington State University, PNNL's partner in BSEL, will receive $620,000 for its research based at WSU Tri-Cities for NABC. NAABB will focus on developing and demonstrating methods to significantly increase production of biofuels from algae. In this project, systems biology — the study of complex biological interactions — will be critical to understanding how organisms, such as algae, work in order to produce sufficient amounts of molecules that store energy, called lipids, in real-world environments. PNNL scientists will carry out comprehensive proteomics analyses to determine the full set of proteins in a cell, and identify specific changes in protein abundance as lipids are produced. The Laboratory also leads in processes to convert whole algae biomass into biofuels. At PNNL's Marine Sciences Laboratory, scientists will be growing algae in a marine environment. Of the $44 million for NAABB, PNNL will receive $7.2 million, with about $2 million of that work being done at MSL. WSU also will receive $495,000 for research based at WSU Pullman for its participation in NAABB. Genifuel is also a recipient of funds within NAABB. Last year, the company licensed a method developed at PNNL for converting algae into renewable natural gas. The University of Washington is another Northwest institution working within the NAABB. Additional information on DOE's announcement, the consortia and the organizations involved in each consortium is available online at http://www.energy.gov/news2009/8519.htm. For more information on ARRA funds awarded to PNNL, visit its Recovery Act web site, http://www.pnl.gov/arra/.